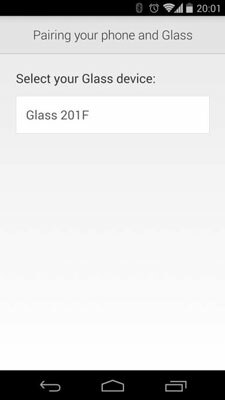 If you have an Android smartphone, you can set up your Glass with the MyGlass app. MyGlass also lets you use additional features, including GPS, SMS messaging, and screencasts. To install MyGlass on your Android phone, your phone needs to be running version 4.0.3 (Ice Cream Sandwich) or later of the Android operating system. Open Google Play from the main Home screen or the All Apps screen on your phone. Tap the magnifying-glass icon at the right end of the menu bar at the top of the screen. The Search box appears in the menu bar. Type MyGlass in the search box and then tap the Search button. The MyGlass app should be the first item listed in the resulting screen. Open a description screen for the app by tapping MyGlass. Tap the Install button in the top-right corner of the description screen. You see the install screen, which describes the requirements for using the MyGlass app. The MyGlass app downloads to your phone. Tap the Open button to run the MyGlass app. In the screen shown, tap the Play icon to view the introductory video. When you finish viewing the video, or to skip viewing the video, tap Continue. If you have more than one Google account, select the Google account that you want to use with your Glass. If you have only one Google account, proceed to Step 5. Tap Pair Phone and Glass. If the Bluetooth connection is off on your smartphone, MyGlass turns on Bluetooth automatically. In the resulting screen, tap the Glass device. 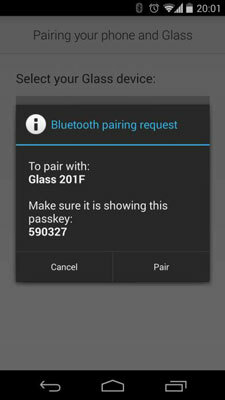 You see a Bluetooth pairing request screen on both your smartphone and your Glass. On your Glass, tap the touchpad to pair Glass with your smartphone. On your smartphone, tap Pair in the Bluetooth Pairing Request pane. 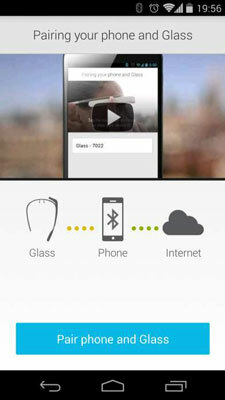 After a short while, the MyGlass app finishes pairing the smartphone and the Glass device. Then your Glass plays a chime through the speaker and displays a welcome message that includes your Google profile picture. In the next screen on your smartphone, get information about the Glass connection by tapping the Device Info card. 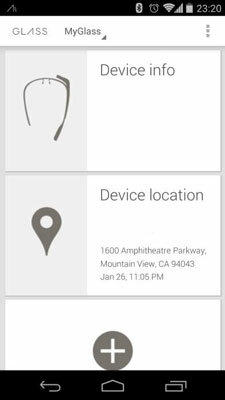 Begin exploring Glass and the MyGlass application on your smartphone.